AUCTION LOCATION: 33460 Western Ave. Union City, CA. 2000 Johnford VMC-1600SHD CNC Vertical Machining Center s/n VP0019 w/ Fanuc Series 18-M Controls, 32-Station ATC, CAT-50 Taper Spindle, Harbor Oil Cooler, Hand Wheel, Chip Conveyor, 39 ½” x 71” Table, Coolant. 2008 Haas VF-2DYY CNC Vertical Machining Center s/n 1067067 w/ Haas Controls, 20-Station ATC, CAT-40 Taper Spindle, 7500 RPM, 20Hp Vector Dual Drive, Baldor Spindle Motor, Extended Travel, Rigid Tapping, Quick Code, USB Port, Chip Auger, 18” x 36” Table, Coolant. 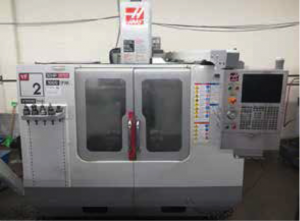 1994 Haas VF-3 4-Axis CNC Vertical Machining Center s/n 83515 w/ Haas Controls, 20-Station ATC, CAT-40 Taper Spindle, Programmable Coolant Nozzle, 18” x 48” Table, Coolant. Mori Seiki MV-40E CNC Vertical Machining Center s/n 123 w/Fanuc Controls, 20-Station Side Mounted ATC, CAT-40 Taper Spindle, 17 ½”x 35 ½” Table, Coolant, Losma Synthesys Series mdl. E1000 Fume Collector s/n 0553. 2005 Sharp SV-2412 CNC Vertical Machining Center s/n 30900338 w/ Fanuc Series 0i Mate-MB Controls, 10-Station ATC, CAT-40 Taper Spindle, Hand Wheel, 12” x 22 ½” Table, Coolant. Matsuura MC-500V CNC Vertical Machining Center w/ Yasnac Controls, 20-Station ATC, BT-35 Taper Spindle, 5000 RPM, 15” x 34” Table, Coolant. 2004 Femco HL-35 CNC Turning Center s/n LK4-1443 w/ Fanuc Series 0i-TB Controls, Tool Presetter, 12-Station Turret, Hydraulic Tailstock, 10” 3-Jaw Power Chuck, Chip Conveyor, Coolant. 1996 Haas HL-2 CNC Turning Center s/n 60511 w/ Haas Controls, 10-Station Turret Programmable Tailstock, 3750 RPM, 8” 3-Jaw Power Chuck, 5C Collet Nose, Coolant. Acra WS-18VH Vertical Mill s/n 802062 w/ Sargon DRO, 3Hp Motor, 70-4200 Dial Change RPM, R8 Spindle, Chrome Box Ways, Power Feed, 10” x 54” Table. Chevalier FM-3VS Vertical Mill s/n BM867313 w/ Sony Millman Programmable DRO, 3Hp Motor, 60-4500 Dial Change RPM, Chrome Ways, Power Feed, 9” x 48” Table. Victor mdl. 1640S 16” x 40” Geared Head Gap Bed Lathe s/n S8405041 w/ Sony LH52 DRO, 30-2000 RPM, Inch/mm Threading, Tailstock, Steady and Follow Rests, Aloris Tool Post, 10” 3-Jaw Chuck, 5C Collet Closer, Coolant. 1995 Arch 13” x 46” Geared Head Gap Bed Lathe s/n 9530007 w/35-2000 RPM, Inch/mm Threading, Tailstock, Steady Rest, Aloris Tool Post, Trava-Dial, 8” 3-Jaw Chuck, 5C Collet Closer, Coolant. 2004 Acra KV-100 40” Vertical Band Saw s/n V100280 w/ Blade Welder, Digital FPM Readout, 19 ¾” x 23 ¾” Main Table, 19 ¼” x 17 ¾” Side Table. 2004 Atlas Copco GX11FF 15Hp Rotary Air Compressor s/n AII629510 w/ 51.7 CFM @ 125 PSIG. (2) Tub Style Media Tumblers. Haas HRT-160 4 th Axis 6 ½” Rotary Head. Huot Toolscoot 50-Taper and 40-Taper Tooling Carts. (13) Kurt 6” Angle-Lock Vises. (1) Kurt 5” Angle-Lock Vises. (3) Kurt 4” Angle-Lock Vises. Troyke mdl. U-12 12” Rotary Table. (36) R8 Collets and Tooling. (5) Huot Drill and Tap Cabinets. 23 ½” x 23 ½” x 17 ¾” Angle Plate. Brown & Sharpe MicroVal CMM Machine s/n 0196-1501 w/ Renishaw MIP Probe Head, Virtual DMIS Software, 22” x 29 ¾” x 3” Granite Table. Gage Master mdl. 49/GMX4 12” Optical Comparator s/n 122612489 w/ GMX PLUS Programmable DRO, Digital Angular Readout, Surface and Profile Illumination, 6” x 12 ½” Table. Mitutoyo Surftest SJ-210 Digital Surface Roughness Gage. Bausch & Lomb Stereo Microscope. Mitutoyo 2.8”-3.2”, 1.8”-2.0”, 1.2”-1.4” Bore Mics. Mitutoyo 18” and 8” Digital Calipers. Mitutoyo 1”-2” and 0-1” Digital OD Mics. Chaun 6”-12” OD Mic Set. Aerospace 0-6” OD Mic Set.